"Choose life. Choose a job. Choose a career. 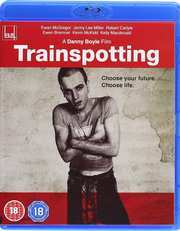 Choose a family..." This is the story of Mark Renton (Ewan McGregor) and his so-called friends – a bunch of losers, liars, psychos, thieves and junkies. Hilarious but harrowing,the film charts the disintegration of their friendship as they proceed seemingly towards self-destruction. Mark alone has the insight and opportunity to escape his fate – but then again does he really want to "choose life"? 40 min feature 'Memories of Trainspotting' with Danny Boyle, Andrew Macdonald, John Hodge, Ewan McGregor, Ewen Bremner, Kelly Macdonald and Robert Carlyle.